Our slogan for IFA 2018 "Future Now." puts the focus on the latest FRITZ! products and trade show launches. Find out more about our top highlights, including FRITZ!OS 7, Mesh WiFi, ultra-fast DSL and Smart Home. 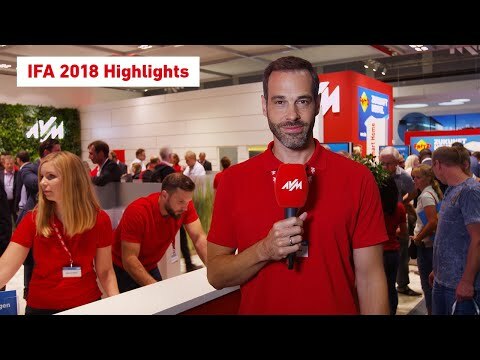 IFA highlights from the AVM stand FRITZ! product premieres and exciting innovations: Gordon Priebe presents the trade fair premieres and shows how FRITZ! can make your home network even faster. Among others, you'll see the FRITZ!Box 7530 with supervectoring, the brand-new FRITZ!Fon C6, the FRITZ!Repeater 3000, and of course FRITZ!OS 7. The FRITZ!Box 7530 - the perfect introduction to fast DSL connections Curtains up for the modern and compact FRITZ!Box 7530. This sleek entry-level router will be shown for the first time at this year's IFA in Berlin, and impresses all the way. It's ready for fast DSL with supervectoring, speedy wireless AC, four gigabit LAN ports, a USB port and a DECT base station for telephony and Smart Home. The new all-rounder for telephony and Smart Home: the FRITZ!Fon C6 This cordless phone combines a wide range of functions with a modern, white design. It's comfortable to hold and offers highlights such as HD telephony, Smart Home applications, internet radio, an answering machine and multiple telephone books. The powerful battery gives the phone a talk time of up to 16 hours - perfect for when mum calls! - and standby times of up to 12 days. Top WiFi speeds wherever you are: the new FRITZ!Repeater 3000 The FRITZ!Repeater 3000 will also be launched at this year's IFA trade show in the German capital. This new Mesh product is perfect for blanketing even large homes or offices in WiFi. Alongside the 2.4 and 5 GHz bands, the new Repeater also includes an additional third 5 GHz band, allowing you to connect all your devices in your Mesh network. This means you'll always have a stable wireless connection, whether you're playing games, streaming videos or just checking your emails. A smarter Smart Home With the new FRITZ!OS 7, both FRITZ!DECT products and devices from other manufacturers that support the HAN FUN protocol can now be used directly with a FRITZ!Box.This includes HAN-FUN-compatible wall switches, door-window contacts and motion sensors, for example from Deutsche Telekom. The FRITZ!DECT 301 - with new features Ready for for when the temperatures drop and we start to heat up our homes, the FRITZ!DECT 301 radiator control is getting some new functions. With the new variable Boost function all you need to do is push a button before leaving the house in the morning, and you'll have a warm and toasty bathroom by the time you get home in the evening. The display content can now be rotated in 90 degree steps to make reading even more comfortable and convenient. Do you already use a FRITZ!DECT 200 or FRITZ!DECT 210 smart plug? You can now use them as temperature sensors for radiator controls or thermostats - it's so easy! Five FRITZ!Box models for supervectoring FRITZ! to the future! The first packages for 35b supervectoring, the new DSL technology with download rates of up to 300 Mbit/s, are now available in Germany. Five FRITZ!Box models support the ultra-fast technology: FRITZ!Box 7590, 7581, 7582, 7530 and the FRITZ!Box 6890 LTE. Our stand at IFA 2018 The IFA is open for visitors from 31 August to 5 September. Experience our latest products and innovations live at the AVM stand. Feel free to approach our staff to find out more. Come see us in Hall 17 at the Berlin exhibition grounds.